Imagine if you were able to control your phone just by thinking about swiping from screen to screen or opening an app. Or what if you were able to simply think about turning the lights off and they automatically turned off? Brain Computer Interfaces (BCIs) is a new technology that uses signals from our brain to control external devices. We can do some amazing things with this technology like allowing paraplegics to walk and creating hands-free applications. There are a lot of different pieces of equipment we can use to measure our brainwaves and transfer this information to produce useful outputs including using electroencephalography (EEG), magnetic resonance imaging (MRI), brain implants, and new alternative to EEG called neural dust. In the brain, there are billions of cells — half are neurons and half help the activity of neurons. Neurons are connected by gateways of activity called synapses. When thousands of neurons fire an action in the same area, the electrical field created is strong enough to spread through bone and tissue, and can be measured on the head surface. 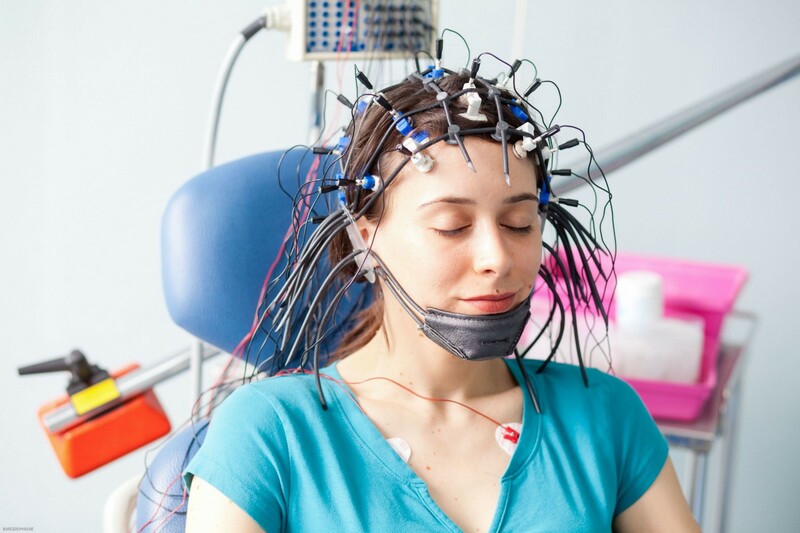 Electroencephalography or EEG is a non-invasive method used to record all electrical activity generated by the brain by placing electrodes on the surface of the scalp. The electrodes can’t detect activity in single neurons, but they are able to detect electrical changes in thousands of neurons’ activity at the same. These electrodes are able to monitor the time course of electrical activity of the brain, and you are able to understand which part of the brain is responsible for the action. However, EEG has a low spatial resolution on the scalp, which means that it requires interpretation to hypothesize the areas of the brain that are activated by a particular response. In addition, this method can only measure electrical activity at the surface of the brain, so it is difficult to understand whether a signal was produced near the surface or from a deeper region in the brain. 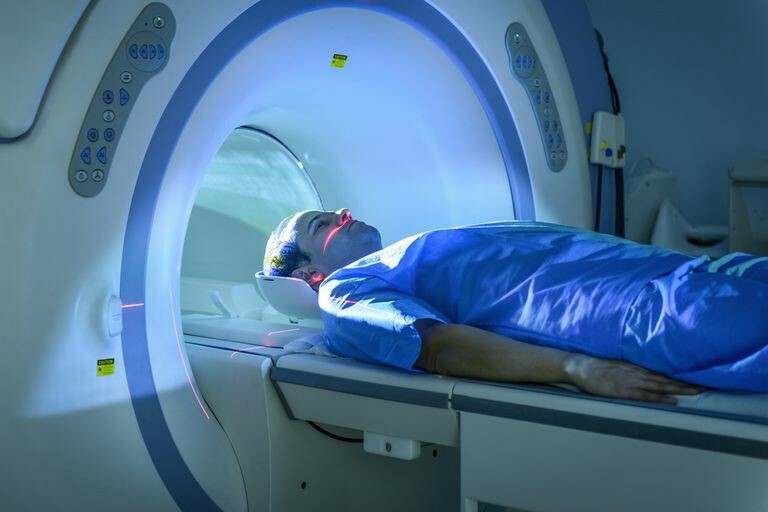 Magnetic Resonance Imaging (MRI) is a non-invasive procedure that uses a strong magnetic field and radio waves to create detailed images of the organs and tissue within the body. This information can be used for determining if there is something abnormal with the brain (tumors) or for assisting with the planning for certain surgeries. The magnetic field from the MRI interacts with protons in the hydrogen atoms in our bodies. This magnetic field makes the protons that are facing in random directions align with the direction of the magnetic field. A quick pulse is then emitted, and after this, the protons relax back to their original state. As this happens, energy is released which is detected by sensors in the MRI machine. Through calculations, a program is able to detect what the tissue looked like and produce an image of this tissue. There have been a lot of studies done that show the use of brain implants to help people or animals regain functionality in certain parts of their body. 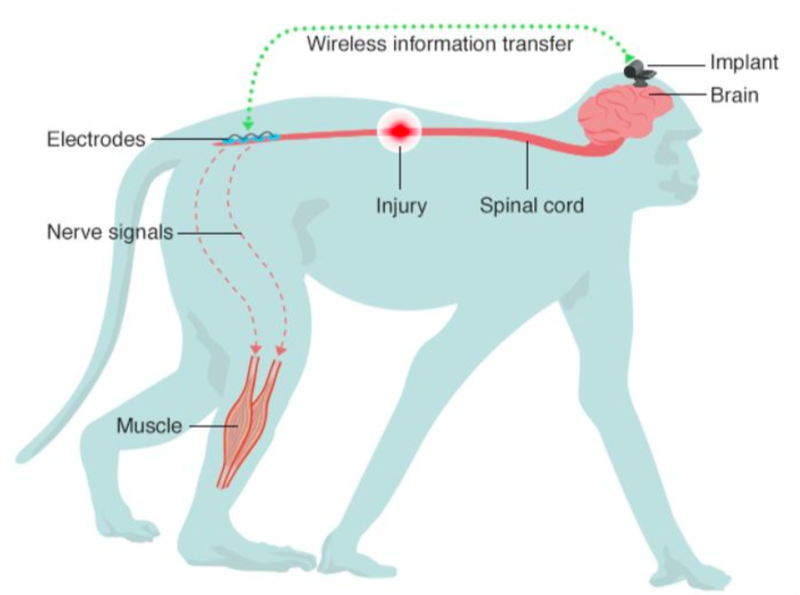 One study showed how a brain implant was used to help paralyzed monkeys regain functionality in their legs. The brain implant was able to simulate electrodes in the leg by recreating recorded signals from the brain, and has been able to enable monkeys with spinal cord injuries to walk. Another study was done with the use of brain implants to help a paralyzed man feel touch in his hands again. By delivering current from the brain implants through electrodes, generated sensations of touch were perceived as coming from the man’s own hand. Neural dust a new technology that can be used as an alternative to EEGs. It is a tiny wireless sensor that can be implanted in the brain and measure electrical activity. Neural dust works by converting ultrasound vibrations into electricity and then transmitting this information to a receiver located outside the body. Each sensor is about 3 millimeters in length, which is a lot smaller than all other implants. The goal is to get this technology down to 50 microns wide, which is about half the average width of a human hair. We can use neural dust for so many different cases. It can be used to help quadriplegic people control prosthetic limbs. The data surrounding electrical activity can be analyzed and based on electrical patterns, corresponding movements for a prosthetic limb can be understood. The team developing neural dust is also looking at applications not only for the brain, but for other parts of the body as well. Collecting data from organs and muscles using this sensor is another use case for this technology as well. We can use brain computer interfaces to help people who are paralyzed move again by sending electrical signals to stimulate their limbs to help them move. There have been many studies done so far that have been successful. We have been able to help paralyzed people move their fingers, walk, and move their arms. We are also able to use this technology to help people with epilepsy. Neuropace is a company that has developed a system called the RNS System that is able to detect seizures before they are about to happen, and then stop them before anything actually happens. This system works by looking for unusual electrical activity in the brain, and once it detects these patterns, it responds by sending pulses to the brain to normalize your brainwaves and prevent seizures from occurring right from the beginning. Using this technology, we are able to do things like control video games just by thinking about them. A company called Neurable has been able to create VR games that can be controlled with your mind. Their device uses electrodes that are attached to the VR headset which are able to read your brain signals. This information is then used to execute certain commands in the VR game. Neurable’s technology is not only able to control VR games, but it can basically control any device. Brain computer interfaces are an amazing technology that we can use to help a lot of people and create huge impact. I am really looking forward to creating BCI applications and innovating in this space! follow my Medium and LinkedIn to stay updated with my progress in brain computer interfaces! check out my website to see some of my projects and talks! 15-year-old machine learning and VR/AR developer. Working with companies like Google, TD, Microsoft and CIBC to further my skills.